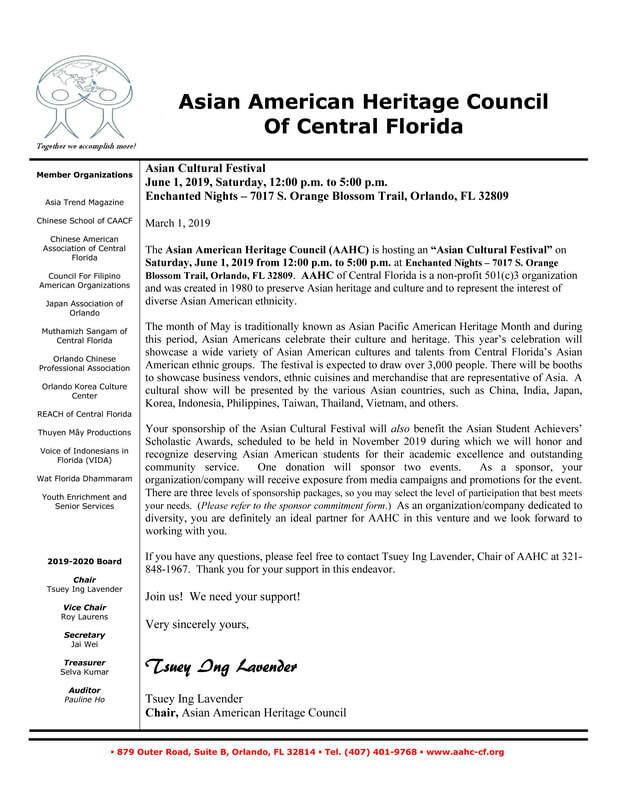 The Asian American Heritage Council, also known as AAHC, is an organization of Asian American organizations in Central Florida – groups ranging from social, cultural, business, religious, educational, professional, to health & fitness and diversity networks. first ever Asian Festival at Lake Eola Park in the heart of theCity of Orlando. Over ten thousand people visited the park that day and enjoyed the cultural presentations at the amphitheater, savored the enticing aroma of ethnic food permeating the park all day, and ogled with wonder the arts and artifacts displayed by participating Asian nation. Asian Americans danced to the lilting strain of music from home. To recognize and reward Asian American students for their academic excellence and exemplary community service and leadership! The annual AAHC Asian Cultural Festival will be held on June 1 at the Enchanted Nights at 7017 S. Orange Blossom Trail, Orlando, FL 32809. For more details, please refer to our scholarship page.